Toby Crabel introduced this way of trading in the ealy ninties in his book "Day Trading with Short Term Price Patterns and Opening Range Breakout". In simple terms this means to trade the brekouts from the limits of the first trading hour with the stop loss at the opposite side. I.e. if the first hourly candle meausres 40 points (Crabel calls this the "stretch") you set the stop loss at breakout level minus 40 points and the take profit at the breakout level plus 40 points. The same with a brekout to the downside. In todays nervous markets the ideas of Crabel do not work as exactly as in former times. But I think that the first hour of index trading is still very significant for the whole day, especially if there are range markets. For the german Dax the hour before the opening (08:00 to 09:00) seems to be very significant. 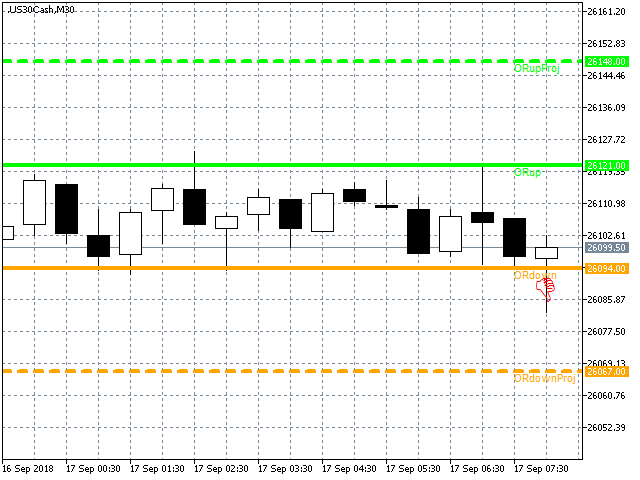 In many instances the opening range is revisited or the breakout goes exactly to the projection of the range. This indicator is less for trading exactly the Opening Range Breakout strategy but for an orientation for the whole day. If you trade ORB anyways I recomend to not set the stop at the other side of the stretch, because it might be a far too big stop loss. Position it tighter (for Dax about 15 to 20 points). Save your individual settings in a.set file. You can chose between local and server time. Default is local time. If you have set 9 for hour and 1 for minute the indicator draws its lines at 09:01 at local time at the extremes of the last hourly candle. If the stretch measures only a few points, e.g. 20 points there migt be a sideways range. Do not trade in this range. if it measures much, e.g. 80 points there may be big movements in either direction ahead. Be aware of false breakouts which occur very often. Toby Crabel suggests to wait for 10 minutes to delete the stop orders. I recomment to wait up to an hour for a breakout. 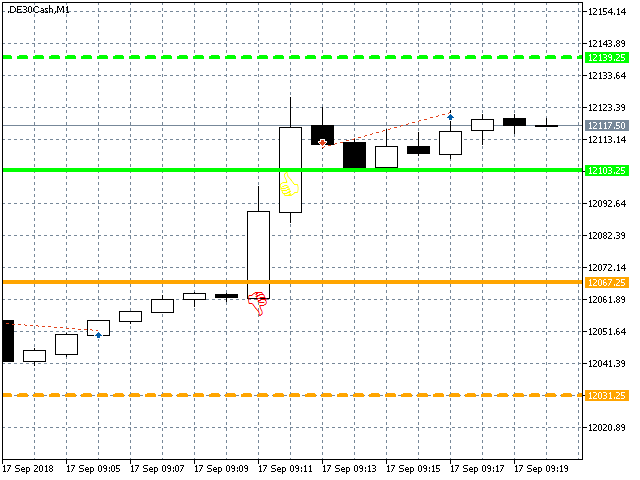 Use this indicator together with WVAPsimple. If you have a market with very low frequency of ticks this indicator does not work, you need at least one tick per minute to detect the trigger time. This tool does not guarantee any success. It is your own responsibility to use it correctly. Contact me over the messages of mql5. 02.05.2019, Terence V. Gronowski "SwissTrader". Now several timeframes and several assets can be tagged with the opening range. Variables are saved in global variables. watch dem pressing f3. Now change of timeframe is possible, the lines remain. Added the Opening Line.